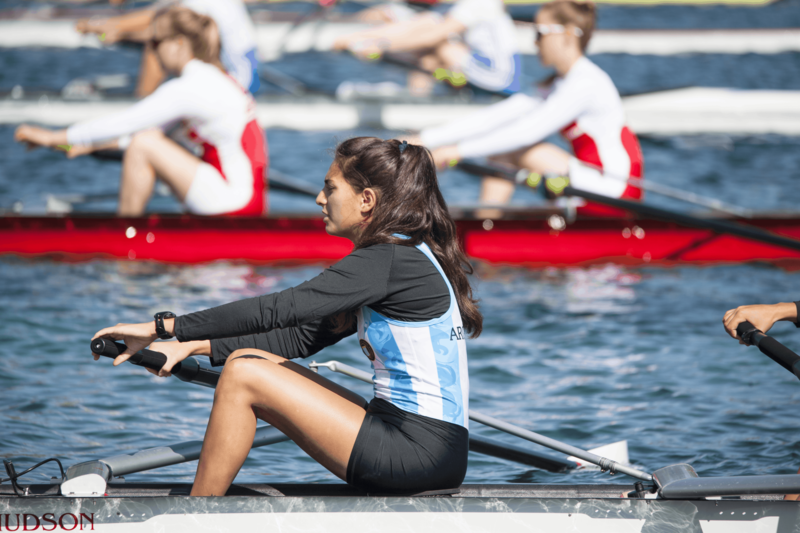 International DRV Junior Regatta – Regatta München e.V. A warm welcome to the International DRV Junior Regatta in Munich! 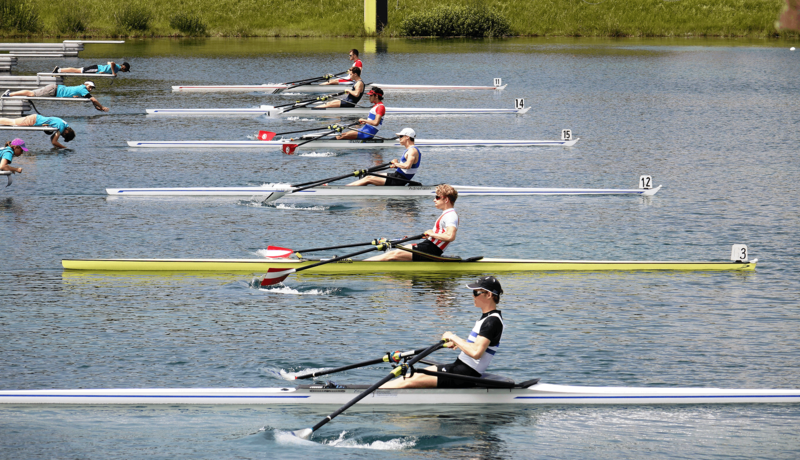 This Munich regatta is the leading European high-performance regatta for Junior rowers. There is no better way to compare and evaluate the performance of your Junior rowers early in the season. We will publish the official regatta programme here once entries have been closed. Please come back later! The official regatta information includes the race schedule as well as general and special remarks defining the regatta. You can display and download it via the link below. The official timetables show you the exact start times for all races and events of our regatta. We will provide all information after entries have been closed by 24.4.2019. After the regatta will have ended, we will post all results of the regatta here. If you want to check specific results, you can use our information system at the touchscreen displays at the information center. All entries, crew changes, scratches and late entries must be made via MAX, the online entry system. From April 1st, 2019 you can enter your boats and book additional services. 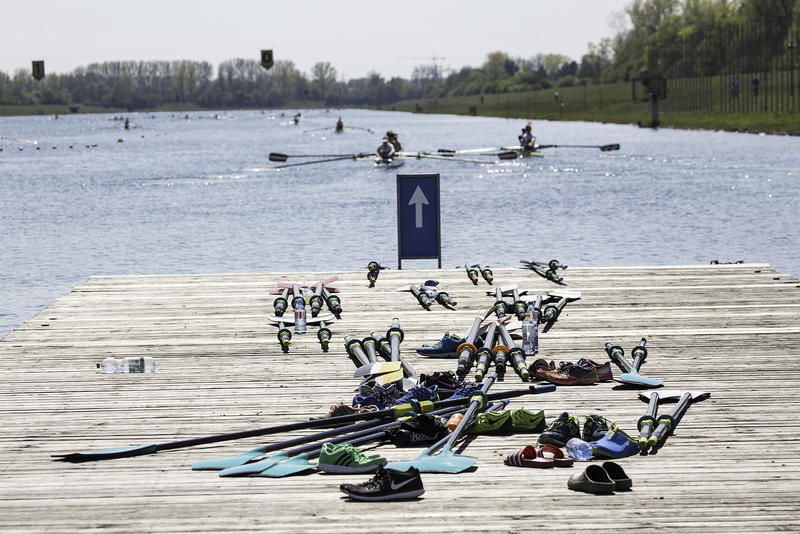 The organisation of the Euro Masters Regatta is divided into several functional areas. You can find the complete race schedule for all days here. For races marked with a *, paragraph 2.5.11.5 RWR (German Rules of Racing) apply. For races 110 to 115 and 125, 126, 128, and 129 on Saturday and for races 239 to 242 on Sunday, there will be heats as well as finals B and A. If more than 15 boats enter per race, a final C will also take place. The heats can be run with up to 7 starting places/lanes per heat. If there are more than 42 boats entered per race, the heats will be run as Time Trial. For all races for age category B: The rules of racing (RWR) of the German Rowing Federation (DRV) apply. For all lightweight races age category A: The rules of racing (RWR) of the German Rowing Federation (DRV) apply for the weigh-in. Eligible are all participants of the age categories U17 and U19 from Germany and international. German rowers must be registered in the DRV athletes’ database and their physical fitness to row must be confirmed in order to start. The entry in the athletes’ database for a rower can also be requested at the regatta until 8pm the evening before his/her first start. A preliminary participation permission is granted in this case. In addition, the medical certificate using the official DRV form has to be presented at the regatta office. Entry deadline is April 24, 2019, 6pm local time. Entries only via MAX, the online entry portal. Late entries are accepted at the team managers’ meeting to fill heats. Fees are doubled. Crew changes, withdrawals and late entries have to be made using MAX, the online entry portal. Entry fees for entries after the entry deadline are doubled. The entry fees are due at the entry deadline on April 24, 2019. Please submit the entry fees to the account indicated below and include the reference number issued by the online entry system or pay online directly using direct debit (German payments only). Otherwise the entry fees must be paid at least by 8pm the day before the race in the regatta office in cash or debit or credit card. The surcharge for on-site payments is 10% of the entry fees (except late entries). Teams that have not paid their regatta fee on time are not eligible to start. Coxswains are not restricted by gender; men may cox women’s crews and vice versa. The Information Center has moved and is NOT located next to the finish tower any more. You can find it next to the LZM on the right side of the course (seen from the finish line). Here, you can pay for your entry fees (cash and cards only). Please ask here for the current list of race results or for further information regarding the regatta course and public transportation. The Regatta Office is open on Friday from 11:30am until 8:30pm, and on Saturday and Sunday from two hours before the first race until two hours after the last race. 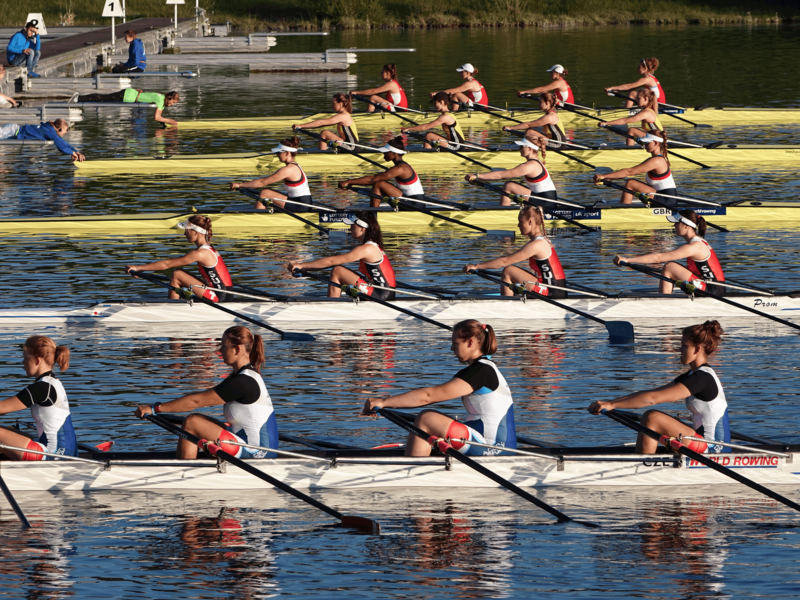 Lightweight rowers have to meet the requirements of paragraph 2.2.4 of the German Rules of Racing (RWR). Scales are located in block B – hall 22 directly at the boat area. Please show your picture ID at the weigh-in. Test weigh-in is available on Friday, May 3, between 2pm and 8pm. The race length is 2000 meters for JW/JM A and 1500 meters for JW/JM B. The races for the JWA and JMA can run on eight lanes, in general they run on six lanes. The time between the races is four minutes. All other races will be divided into qualifying divisions one evening before the start. The Saturday races are considered as qualification for the Sunday races. Sunday’s heats will be set by the jury according to Saturday’s standings. In case of equal standings, time is considered. Teams that did not start with the identical team (exception: coxswains) on Saturday will be placed in the last division. Except for the preliminaries, there will be an award ceremony after every race. Juniors B Only the winners of each run will be honoured directly after their race at the winners’ pontoon. Due to the tight timing, the athletes will remain in their boats. Juniors A For races without preliminaries, only the winners of each run will be honoured directly after their race at the winners’ pontoon. Due to the tight timing, the athletes will remain in their boats. For races with preliminaries, places 1 to 3 of the races of the A finals will receive their medals (Gold, Silver and Bronze) on the winners’ rostrum. Team tents can be placed along the course in designated areas after a permit has been obtained from the Information Center. The space will be assigned by the regatta management. Camping facilities available at the regatta course from May 3 to 5, 2019. Fees apply. The number of persons on the premises is checked regularly on all days. Reservations can be made using our online entry system starting April 1, 2019. A catering service will provide breakfast, lunch, and dinner. Food for the teams should be ordered in advance at a reduced price using our online entry system MAX. There is a surcharge of 10% on site (availability not guaranteed). Regatta München cooperates with Münchener Hotel Verbund, the Munich hotel association. Please click here for the official booking site with special offers for the Juniors Regatta. There is no boat rental available. Our very own Regatta Media Team offers a daily livestream, shown at the regatta course and via the web.